This ARM tutorial covers ARM core, core extensions, co-processor and ARM processor types. Refer following pages for other ARM tutorial contents. It has a load and store architecture. Separate instructions for Load( loading the registers from memory) & Store( storing the register contents into memory) are available. No direct data processing in memory. • Hardware extensions are standard components placed next to the ARM core. • Improve performance, manage resources, and provide extra. • Functionality and are designed to provide flexibility in handling particular applications. Coprocessors can be attached to the ARM processor. Extends the processing features of a core by extending the instruction set or by providing configuration reg-isters. More than one coprocessor can be added to the ARM core via the coprocessor interface. 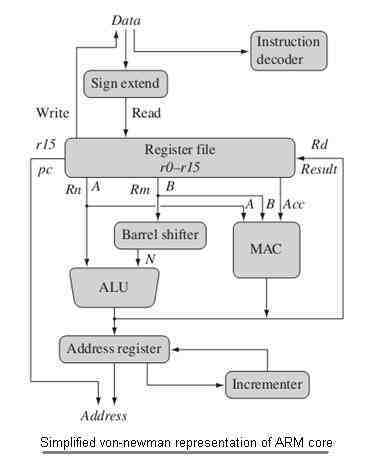 The ARM processor uses coprocessor 15 registers to control the cache, TCMs, and memory management.